Download "Special Education Audit: Organizational, Program, and Service Delivery Review. Yonkers Public Schools. 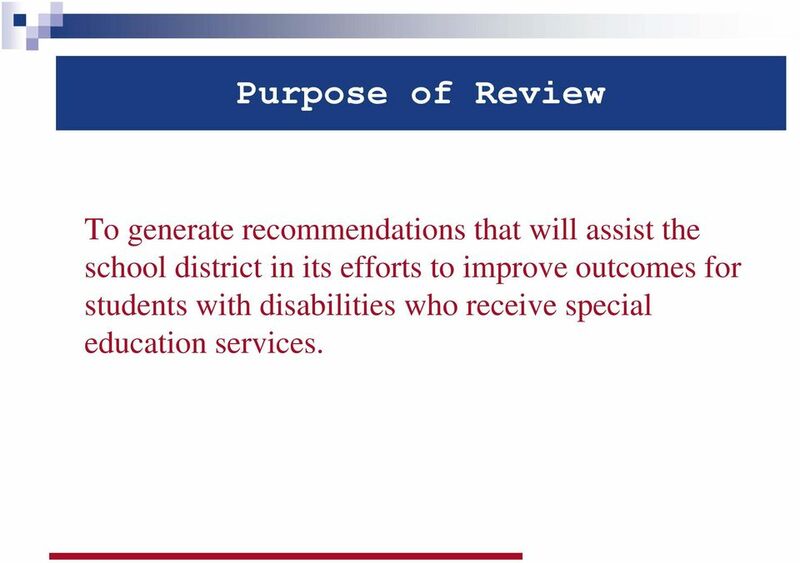 A Report of the External Core Team July 2008"
4 Purpose of Review To generate recommendations that will assist the school district in its efforts to improve outcomes for students with disabilities who receive special education services. 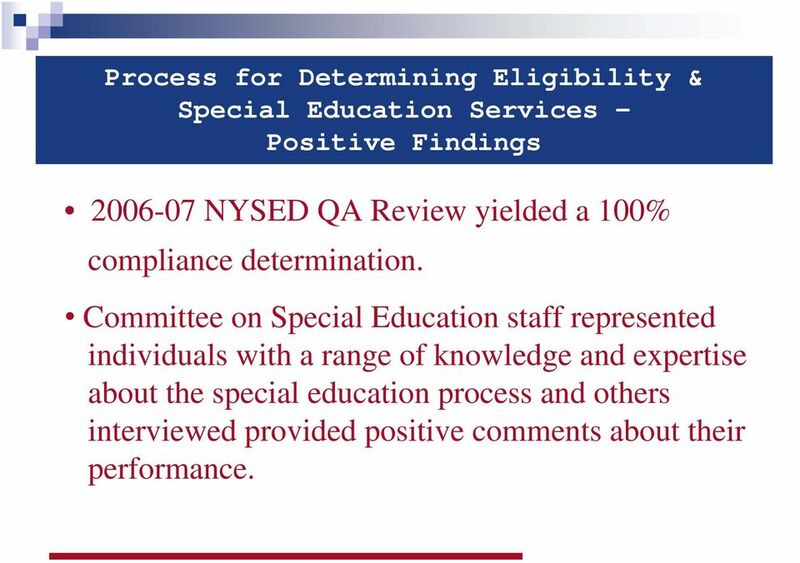 7 Process for Determining Eligibility & Special Education Services Positive Findings NYSED QA Review yielded a 100% compliance determination. Committee on Special Education staff represented individuals with a range of knowledge and expertise about the special education process and others interviewed provided positive comments about their performance. 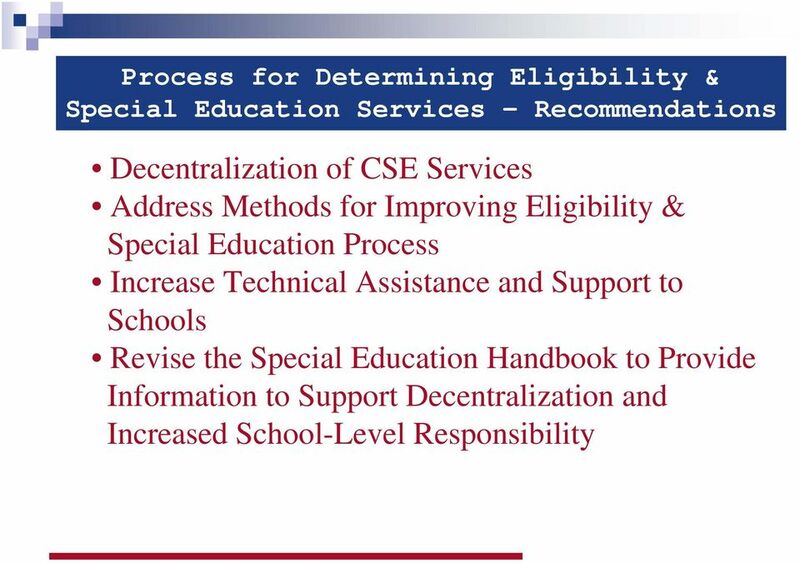 9 Process for Determining Eligibility & Special Education Services Areas for Discussion The process is highly centralized and managed at the district office. YPS does not utilize a schoolbased subcommittee approach to the extent authorized by New York regulations. Each school has a CSE Liaison to assist with the CSE process, but not all are situated in the school full-time. 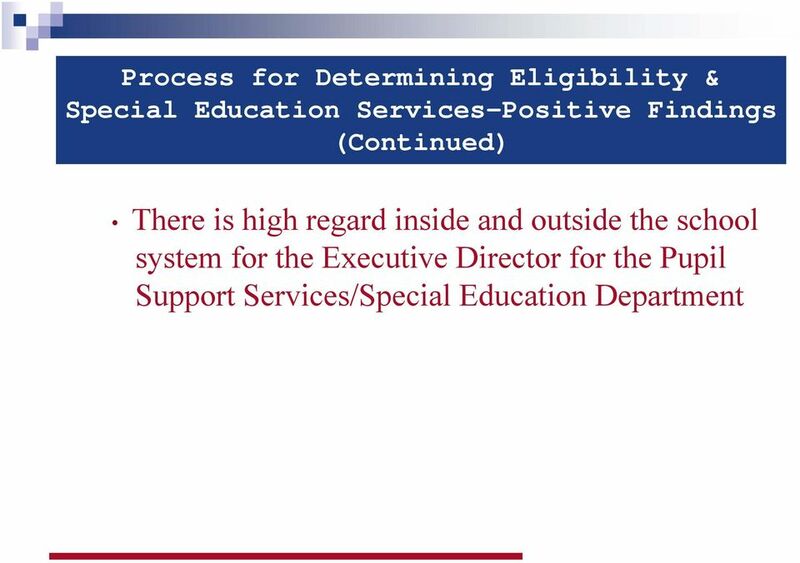 10 Process for Determining Eligibility & Special Education Services Areas for Discussion (Continued) In the school year, only 43.8% preschoolers and 37.7% school-age students were evaluated in a timely manner. 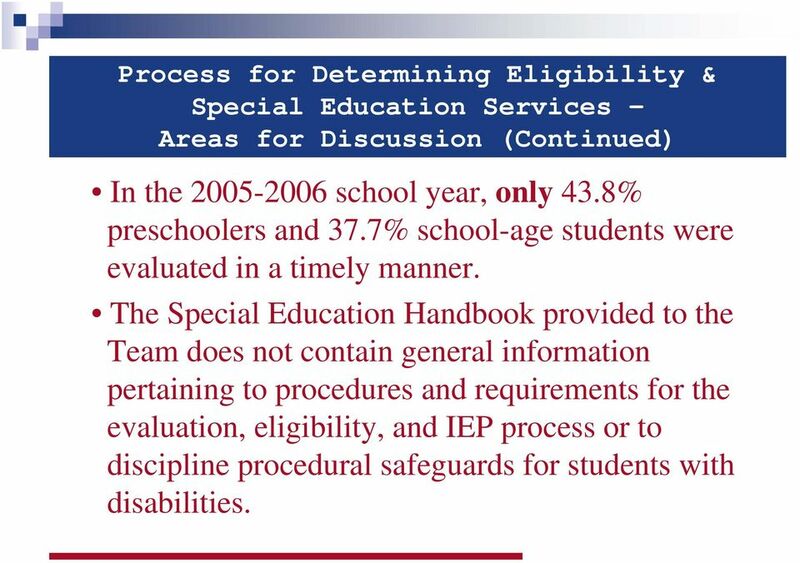 The Special Education Handbook provided to the Team does not contain general information pertaining to procedures and requirements for the evaluation, eligibility, and IEP process or to discipline procedural safeguards for students with disabilities. 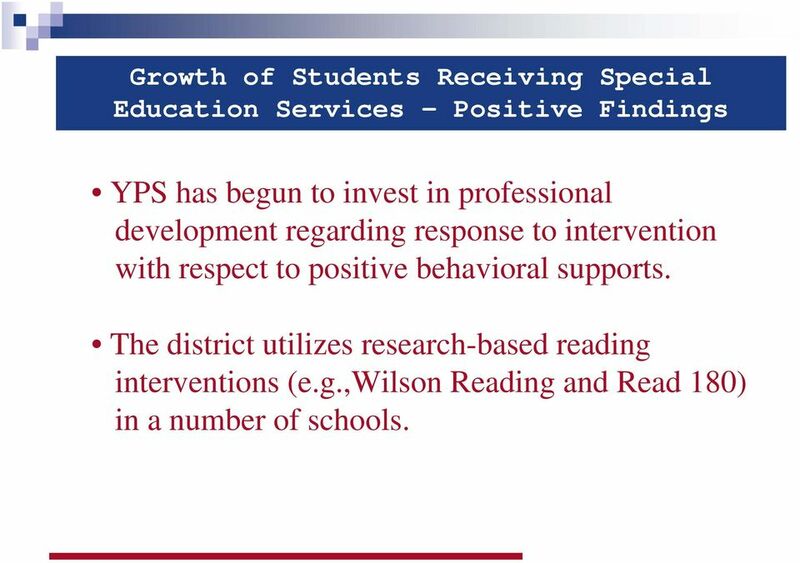 12 Growth of Students Receiving Special Education Services Positive Findings YPS has begun to invest in professional development regarding response to intervention with respect to positive behavioral supports. The district utilizes research-based reading interventions (e.g.,wilson Reading and Read 180) in a number of schools. 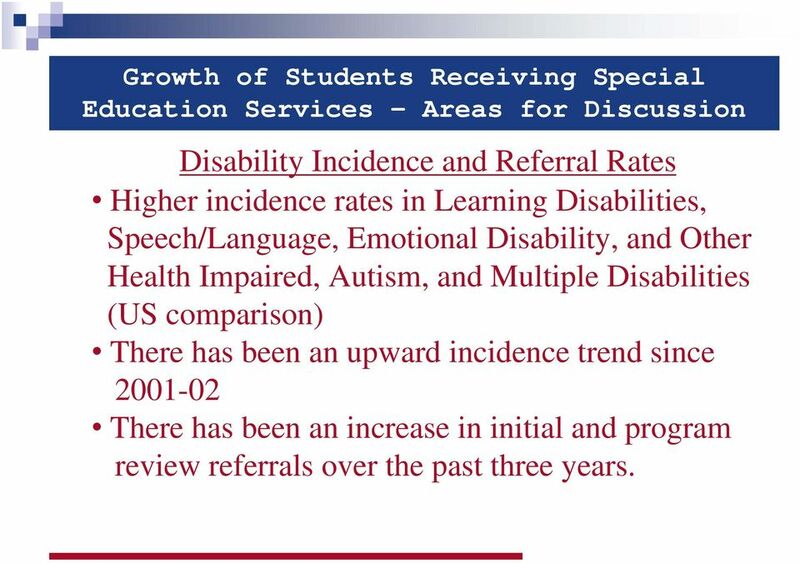 13 Growth of Students Receiving Special Education Services Areas for Discussion Disability Incidence and Referral Rates Higher incidence rates in Learning Disabilities, Speech/Language, Emotional Disability, and Other Health Impaired, Autism, and Multiple Disabilities (US comparison) There has been an upward incidence trend since There has been an increase in initial and program review referrals over the past three years. 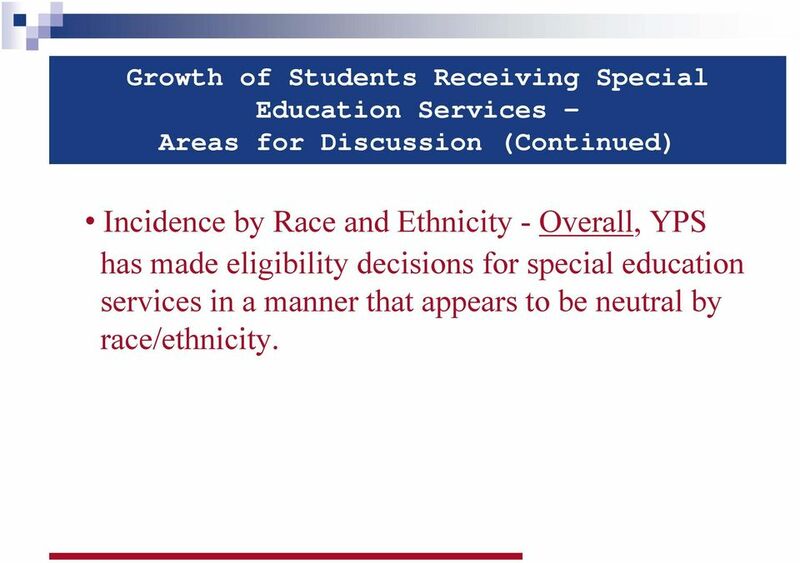 14 Growth of Students Receiving Special Education Services Areas for Discussion (Continued) Incidence by Race and Ethnicity - Overall, YPS has made eligibility decisions for special education services in a manner that appears to be neutral by race/ethnicity. 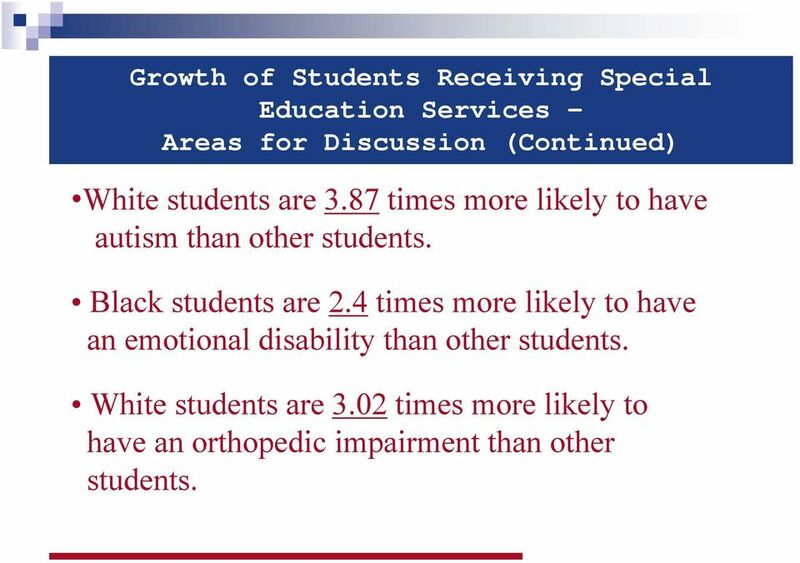 15 Growth of Students Receiving Special Education Services Areas for Discussion (Continued) White students are 3.87 times more likely to have autism than other students. Black students are 2.4 times more likely to have an emotional disability than other students. White students are 3.02 times more likely to have an orthopedic impairment than other students. 16 Growth of Students Receiving Special Education Services Areas for Discussion (Continued) Tiered Early Intervention & Progress Monitoring There is a comprehensive referral package, but it is lacking in specific information pertaining to the goals of intervention and objective data to determine whether various interventions were successful. 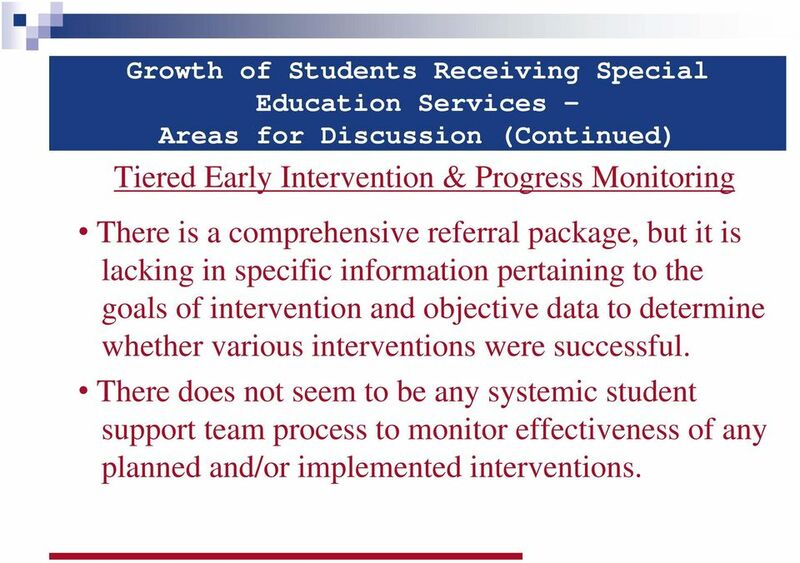 There does not seem to be any systemic student support team process to monitor effectiveness of any planned and/or implemented interventions. 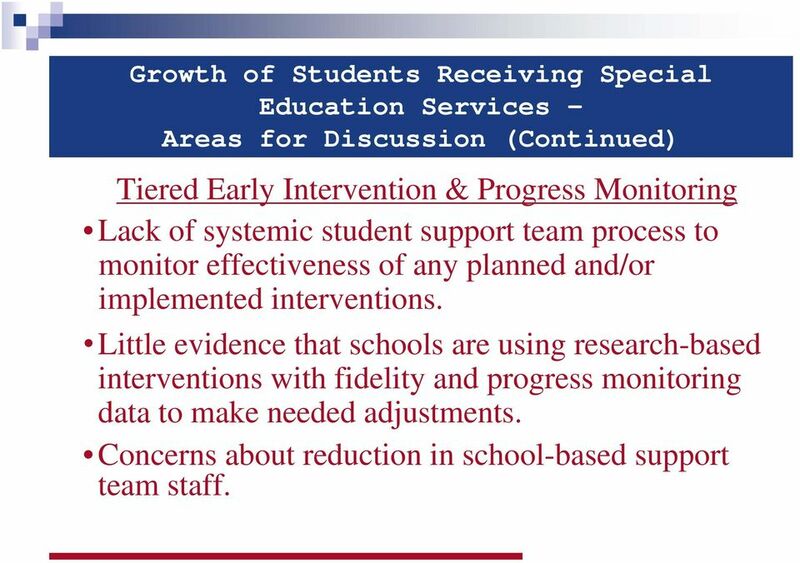 17 Growth of Students Receiving Special Education Services Areas for Discussion (Continued) Tiered Early Intervention & Progress Monitoring Lack of systemic student support team process to monitor effectiveness of any planned and/or implemented interventions. Little evidence that schools are using research-based interventions with fidelity and progress monitoring data to make needed adjustments. Concerns about reduction in school-based support team staff. 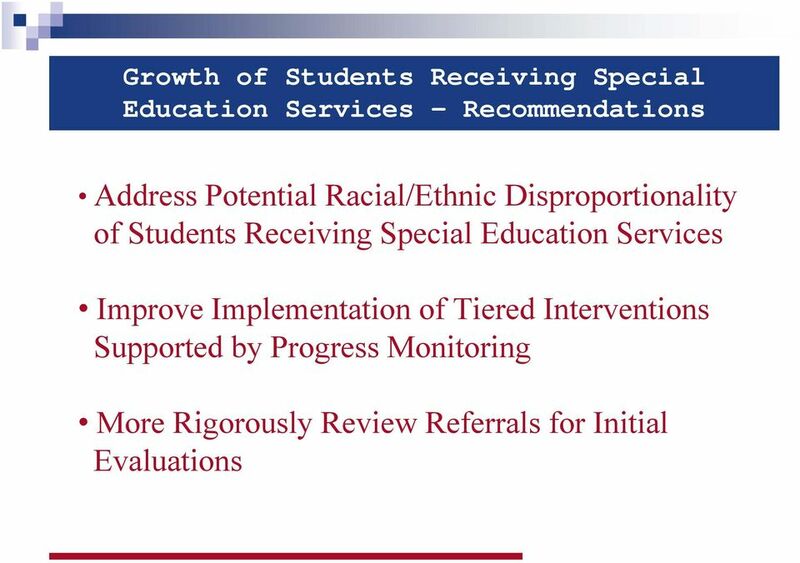 18 Growth of Students Receiving Special Education Services Areas for Discussion (Continued) Inadequate Referrals Completing full evaluations in response to requests from schools or parents in the absence of documented pre-referral intervention and progress monitoring is inappropriate and contributes to a backlog of evaluations. 20 Placement in Various Educational Programs & Settings - Positive Findings The special education department has been receiving professional development from a nationally-known expert who focuses on general and special educator collaboration and differentiated instruction. 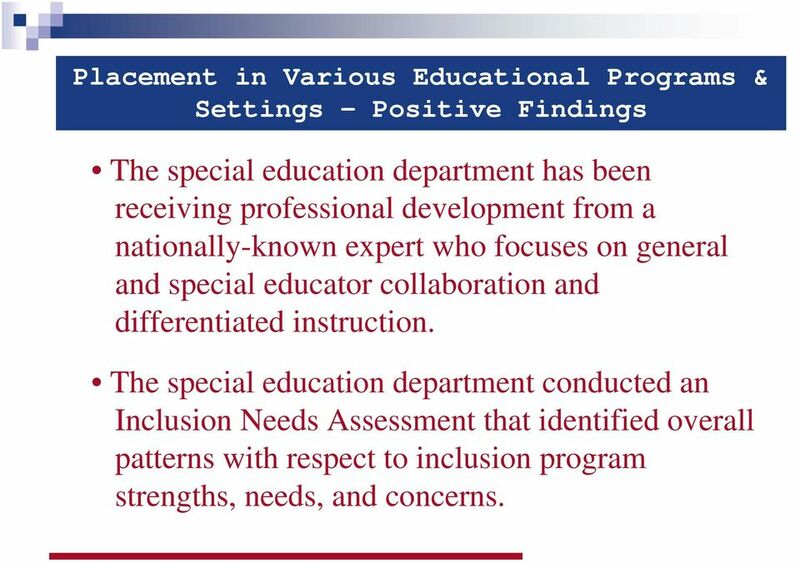 The special education department conducted an Inclusion Needs Assessment that identified overall patterns with respect to inclusion program strengths, needs, and concerns. 22 Placement in Various Educational Programs & Settings Areas for Discussion (Continued) General Findings YPS students are placed in more restrictive settings compared to average rates in the nation, New York, or the other four largest NY cities (except for NYC). There is a much greater percentage of YPS students placed in self-contained classes than would be expected based on state and national data. 23 Placement in Various Educational Programs & Settings Areas for Discussion (Continued) By Disability By far, the largest number of students in separate settings are those with emotional disturbance. The next largest group is students with multiple disabilities. Compared to both national and NY State data, YPS students are educated in self-contained classes at a much greater rate in every disability area except for orthopedic impairments. 24 Placement in Various Educational Programs & Settings Areas for Discussion (Continued) By Disability Only students in relatively mild disability areas are educated in regular classes at least 80% of the school day. 25 Placement in Various Educational Programs & Settings Areas for Discussion (Continued) By Race/Ethnicity A higher percentage of African American (AA) students are placed in separate settings than are white or Hispanic students. A higher percentage of AA and Hispanic students are educated in self-contained classes than are Asian and white students. 26 Placement in Various Educational Programs & Settings Areas for Discussion (Continued) By Race/Ethnicity AA students are educated at a lower percentage in regular classes compared to all other students. The full report provides more details on race/ethnicity within grade clusters and special education categories. 27 Placement in Various Educational Programs & Settings Areas for Discussion (Continued) Students Served Outside YPS Overall, 45% of all students with autism, emotional disabilities (ED) and multiple disabilities are educated outside of the district. The largest group is ED with 208 students being served out-of-district. 28 Placement in Various Educational Programs & Settings Areas for Discussion (Continued) Programmatic Information New York s State Performance Plan contains required performance indicators for the percentage of students in various educational settings. For YPS to meet these targets for the district would have to transition a significant number of students to less restrictive settings. 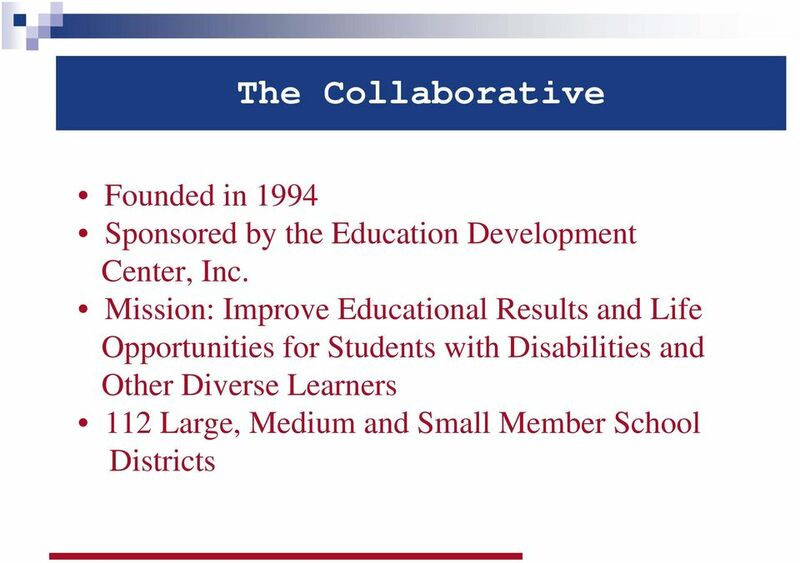 30 Placement in Various Educational Programs & Settings Areas for Discussion (Continued) Inclusion Generally, the only inclusion model practiced by the district is one in which a special and general educator co-teach the full day together in an inclusion class. According to a list of inclusion classes for the school year, YPS has 75 inclusion classes at 16 of its schools. 31 Placement in Various Educational Programs & Settings Areas for Discussion (Continued) Inclusion The inclusion classes are well staffed. Concerns from many school-site staff include: Proper placement of students in the inclusion classes Training of co-teaching and its implementation Equal sharing of responsibility. 32 Placement in Various Educational Programs & Settings Areas for Discussion (Continued) Inclusion The challenge for YPS is to support teachers and school communities so that more students currently educated in inclusive settings are successful and that students currently in more restrictive settings can be educated appropriately in these environments. 34 Placement in Various Educational Programs & Settings Recommendations Examine Racial/Ethnic Data by Calculating Risk Ratios. Review & Streamline Current Self-Contained Program Models. Expand Number of Students with Disabilities in General Education Classrooms Between 40-70% of the Time. 35 Placement in Various Educational Programs & Settings Recommendations (Continued) Expand range of inclusion delivery models. Discuss with Teachers Union the Efficacy of Inclusion Classroom Staffing Conduct Better Follow-up on Professional Development Relative to Inclusion. 37 Performance Outcomes, Instruction, Data Analysis, & Professional Development Positive Findings YPS was 0.3% from meeting the NY target for high school drop-out, and the district met the NY high school target for ELA performance. YPS superintendent and special education/pupil support director are familiar with performance data of students with disabilities in various educational settings. 38 Performance Outcomes, Instruction, Data Analysis, & Professional Development Positive Findings (Continued) Gorton High School is implementing the Strategic Instruction Model (SIM). Although high school students with disabilities did not meet the AYP target for ELA, it did meet the NY SPP target in this area. YPS Special Education Training and Resource Center (SETRC) is part of the NYSED s Training Network. 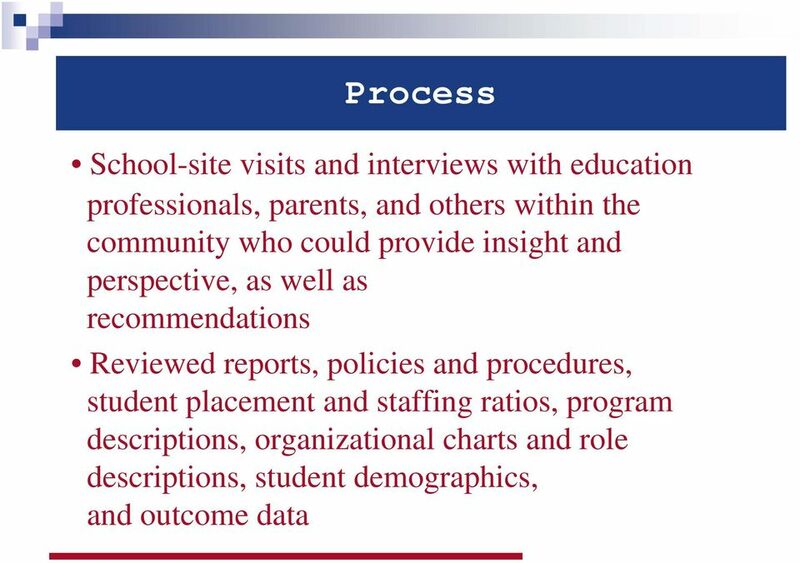 39 Performance Outcomes, Instruction, Data Analysis, & Professional Development Areas for Discussion (Continued) NY State Performance Plan Academic Indicators YPS failed to meet Graduation and Dropout rate indicators for , but were very close to meeting them. YPS did meet the target for state assessment participation in High School ELA or Math, but did not meet them for elementary. 44 Performance Outcomes, Instruction, Data Analysis, & Professional Development Areas for Discussion (Continued) Relationship of IEPs to Student Needs Scores on a variety of assessment are provided without an explanation of their meaning, limiting their value to parents and teachers. None of the IEPs reflect recent statewide assessment scores or provide a history of such scores. IEP goals did not include current performance and in some cases did not align with student needs. 45 Performance Outcomes, Instruction, Data Analysis, & Professional Development Areas for Discussion (Continued) Data Analysis YPS has access to a fair amount of data regarding students by disability area, educational settings, student performance, racial/ethnic composition of students by disability area, and educational settings. Typically, however, this data reflected raw numbers and was not analyzed. This type of information does not lend itself to easy interpretation or comparison. 46 Performance Outcomes, Instruction, Data Analysis, & Professional Development Areas for Discussion (Continued) Professional Development While YPS needs assessment produced positive comments about district-wide training, the Team received feedback suggesting that the training is not always aligned with school and teacher needs. YPS requires all non-tenured teachers to receive mandated professional development, which may be fulfilled through SETRC course offerings. Training is not mandated for tenured teachers and sometimes courses fill up with priority for the non-tenured teachers. 48 Financial Implications - Areas for Discussion Budget Implications: Budget for Special Education Services Like most school districts, special education services comprise the second largest budget area for YPS (25%). Considering the district s receipt of state and federal reimbursement, approximate reimbursement for out-of-district programs and Medicaid, special education is reduced to about 15.7% of YPS total budget. 49 Financial Implications Areas for Discussion (Continued) Budget Implications: Budget for Special Education Services According to the Sept Budget Document, the total adopted appropriation for administration of special education is a surprisingly low $4,128,898 or 4.88% of the special education services budget. 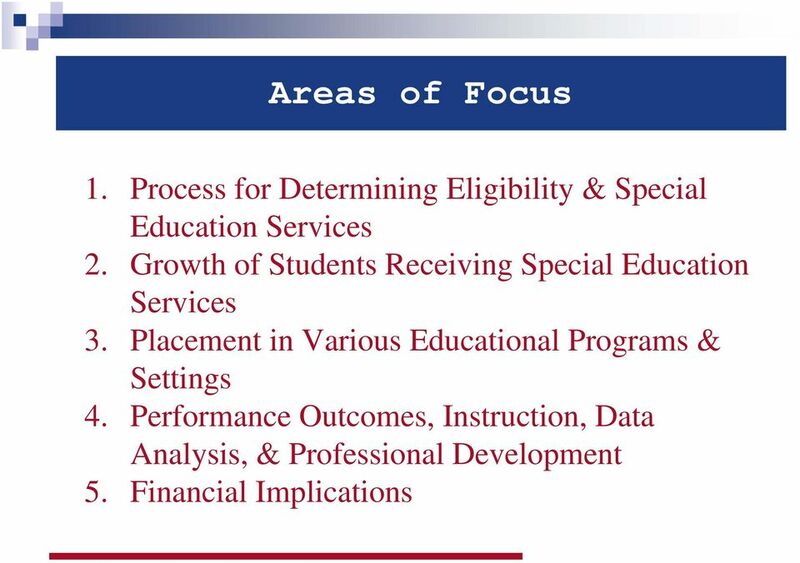 50 Financial Implications Areas for Discussion (Continued) Budget Implications: Out-of-District Costs YPS places a disproportionately high rate of its students with disabilities in out-of-district settings. YPS utilizes three types of programs to serve students with disabilities for whom it is unable to provide a free appropriate public education: public school programs offered through a BOCES or another public school district; or a private school. 51 Financial Implications Areas for Discussion (Continued) Budget Implications: Out-of-District Costs Data showed the total out-of-district program costs were $26,037,267 (including school costs for private and other district schools). The out-of-district costs, including school costs for other public district and private schools, comprise 25.6% of the special education/transportation budget for 13% of the special education population. 52 Financial Implications Areas for Discussion (Continued) Budget Implications: Out-of-District Costs The out-of-district transportation alone is 26.6% of the special education transportation budget. 53 Financial Implications Areas for Discussion (Continued) If YPS aggressively implements the recommendations of Section III, the cost savings associated with the outof-district placements and related transportation should be sufficient to off-set any additional costs pertaining to in-district and services in less restrictive settings. Such savings should be sufficient in the long run to support additional administrative staff that would be essential to facilitate planning and implementation. 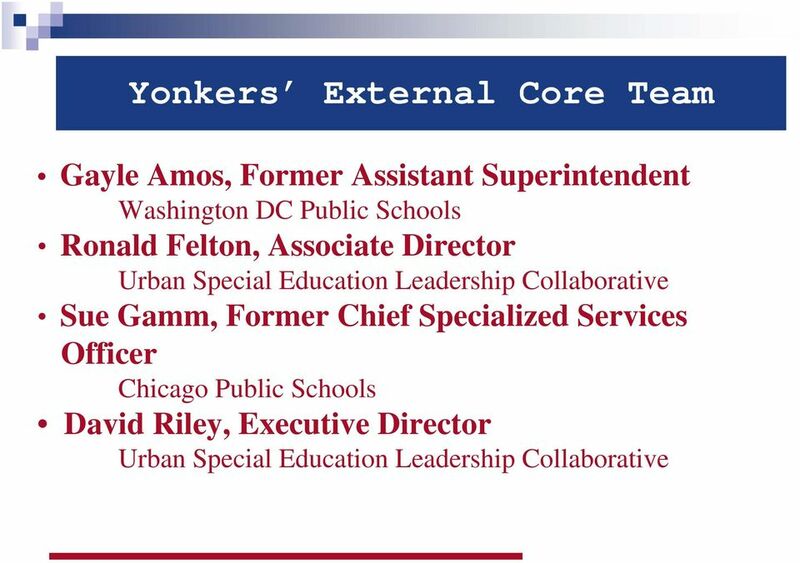 54 Financial Implications- Areas for Discussion (Continued) Staffing Ratios An look at YPS staffing ratios to other urban districts is provided in the report based on a survey conducted by the Collaborative. YPS staffing ratios are smaller than most (special educators, psychologists, and nurses) or all/almost all (OT and PT) other districts. In other areas, YPS is about in the middle of all districts (speech/language pathologists and social workers). 55 Financial Implications- Areas for Discussion (Continued) Regulatory Impact New York has a variety of regulatory requirements that exceed those of IDEA and add to the cost of YPS administration and delivery of special education services. These requirements along with their regulatory basis are provided in the report. 56 Financial Implications- Areas for Discussion (Continued) Due Process Hearing Requests The school district is not being weighed down by large numbers of due process and other special education related complaints and/or litigation. Kristen DeSalvatore, Coordinator of Federal Reporting. School Year. Important: Due Date is August 7, 2015.